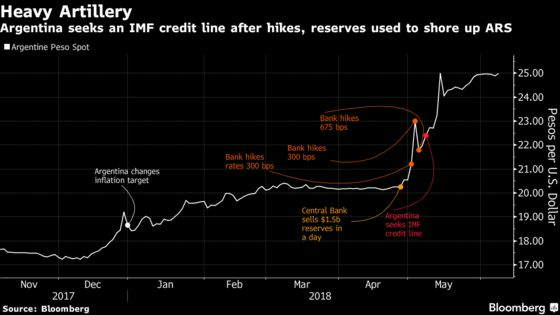 (Bloomberg) -- Argentina secured a $50 billion stand-by arrangement from the International Monetary Fund to help restore investor confidence as the government takes aim at double-digit inflation and a widening budget deficit. The rescue program’s size, which would run for 36 months, is the largest ever in IMF history though it will depend on how much the government taps. It comes amid an emerging market sell-off that has shaken developing economies around the world including Brazil, Turkey, Indonesia and Mexico and has forced central banks to hike interest rates. Officials are worried about the risk of contagion amid rising U.S. interest rates and a strong dollar. With the Federal Reserve tipped to raise rates when it meets next week, central bank governors of India and Indonesia this week called on the Fed to be mindful of its actions. Of the economies that have been hit hardest, Argentina tops the list. It has indicated it plans to draw on the first tranche of the program, after which it will treat the loan as precautionary, the government said in a statement. 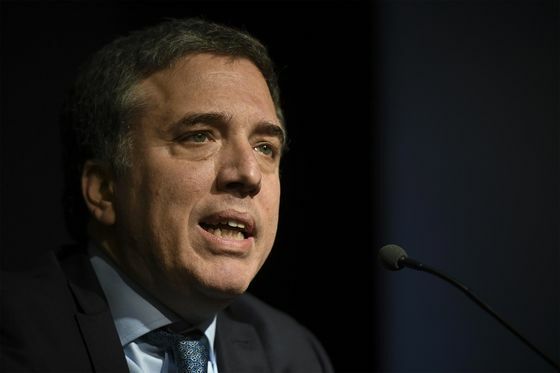 "The amount we received is 11 times Argentina’s quota, which reflects the international community´s support of Argentina," Treasury Minister Nicolas Dujovne said in Buenos Aires. “It’s very good news that the integration with the world allows us to receive this support." Argentina may see 30 percent of the funds a day or two after the Fund’s June 20 board meeting. As part of the agreement, the country will now target a fiscal deficit of 1.3 percent of gross domestic product in 2019 and 2.7 percent this year. The previous targets were 2.2 percent and 3.2 percent, respectively. A new inflation target of 17 percent is set for 2019. “This is a plan owned and designed by the Argentine government, one aimed at strengthening the economy for the benefit of all Argentines,” IMF Managing Director Christine Lagarde says in the statement. Markets will respond positively to the size of the program as well as the “relatively light” policy demands for this year, according to Stuart Culverhouse, chief economist and head of fixed-income research at Exotix Capital in London. Still, “delivering the fiscal adjustment and lower inflation next year, an election year, could still prove challenging,” he said. Argentina’s government was forced into the talks with the Fund last month after three central bank rate hikes pushed borrowing costs above 40 percent, but failed to halt a plunge in the currency. The peso fell 25 percent against the dollar this year to trade at 24.9850 on Thursday. President Mauricio Macri initiated talks with the IMF on May 8 -- a decision that could cost Macri crucial votes in next year’s presidential election. The Fund is unpopular in Argentina and blamed by many citizens for the nation’s historic debt default in 2001 and the ensuing economic crisis. Central Bank President Federico Sturzenegger said the bank will still intervene in currency markets in times of “disruptive movement." The central bank will not target inflation this year, he said. The government has agreed to send a bill that gives the central bank more autonomy, though details on the timing were scant. The economy may expand 0.4 percent to 1.4 percent this year, the Treasury minister said. "We’re convinced that we’re on the right track, that we managed to avoid a crisis, gather support for the program we already had and that has been in place since Dec. 2015, which looks to build a normal economy, reduce poverty and protect the vulnerable," Dujovne said.